This photograph of the first Thameslink train departing from Littlehampton to London Bridge, pictured at Goring-by-Sea, was sent in by John Vaughan. He said: "As and from Monday 11 December 2017 two important Littlehampton to London Bridge commuter trains (and evening return services) have been transferred to Thameslink operation from Southern, the first timetabled workings by that train opertaing company along the Coastway West lines. Photographed on a cold, wet and windy winter morning at 06.04 Class 700 No.700143 forming the very first such train, the 'driver only operated' 1H80, the 05.52 departure from Littlehampton, pauses at Goring by Sea station on its way to the Capital." Thameslink trains are serving more West Sussex stations as a small number of services transferred from Southern earlier this week. 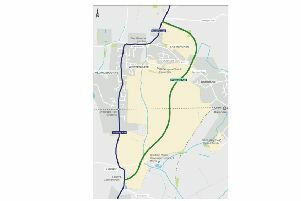 Both networks are run by Govia Thameslink Railway, which is in the middle of revising its timetables as it looks to take advantage of new infrastructure and trains provided by the Thameslink Investment Programme. The services transferred to Thameslink from Monday (December 11) are all to or from London Bridge and either depart or arrive at Littlehampton or Horsham. These will be the new 12-carriage Class 700 trains. Responding to reports this would mean commuters would have to pay more, GTR explained the ticket changes only affected a small number of passengers from Horley, Salfords, Earlswood, or Redhill. A spokesman said: “GTR is modernising the network with new trains, upgraded infrastructure and new ways of working to create faster, more frequent journeys across the network. While the new trains replace the previous service operated by Southern, by May 2018 they will form part of the new expanded Thameslink network. The company says the changes will mean new, faster, and more seamless journeys across the heart of London.